While using InventoryEdge, you may find that you need to change a user's role to give them a different set of permissions. Changing a user's role will not affect their login or password and will only change their functionality within the product. For more information about each user role, please visit the InventoryEdge Users page. Click Save/Next Step at the bottom of the InventoryEdge Participant Information page. Complete the rest of the steps as necessary. If you are assigning a user to the role of Site Administrator or Requester, be sure to assign them to the appropriate Location. 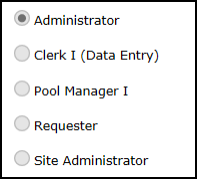 If you are assigning a user to the role of Pool Manager I, be sure to assign them to the appropriate pool.